Are you ready for a Vintage Romance Art Recipe? Combining Finnabair's new Romance Pink and Red Wine Art Alchemy Metallique Paints + new Plaster Paste + Mechanicals Hearts = true vintage LOVE! Come see what Finn's amazingly talented team stirred up with this recipe. My project was inspired by love, of course. The writing says "We have enough time" and it makes me think that love is invincible and everlasting. 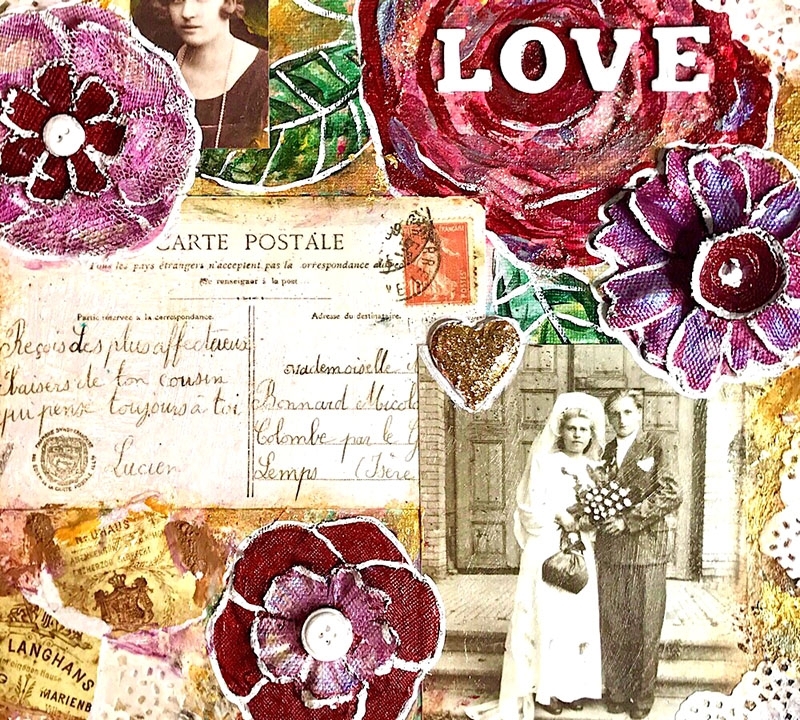 My vintage lovers are surrounded by colorful pink and wine-red elements like buttons, pieces of lace flowers, Mechanicals Gears, and Melange Art Pebbles, covered with the newest Metallique paints. They give my elements amazing deep color and shine. In the background I used the new Paper Texture Paste which helped me to achieve a really interesting texture on my project. For me, the coolest element on my project is the Mechanical Tin Heart that I simply adore! I love to accent metal, paper, and plastic elements with a white gel pen as the final touch to many of my projects. It's such a simple trick that adds this special little something to all the embellishments, and the overall look. I hope my vintage crown will encourage you to make (with your own hands!) a very special present for your other half. The new Art Alchemy Metallique colors are so rich and sparkly!I used old pictures from Finnabair's Ephemera pack of photos and some of the amazing new products. I love the new Paper Paste for texture and building up the canvas, then I simply added some paint on top. After I painted the abstract background and a rose with leaves, I chose some vintage pictures and glued on my canvas with 3D Gel. I think a lot of people might have this kind of pictures of their great grandparents, but any photos you love would work. If actual photos are too precious for you, simply make a photocopy and then you can paint and alter without any worry. I just love the look of old, grainy photographs. I also love the idea of ephemera like old love letters, stamps or tickets being incorporated into the piece. 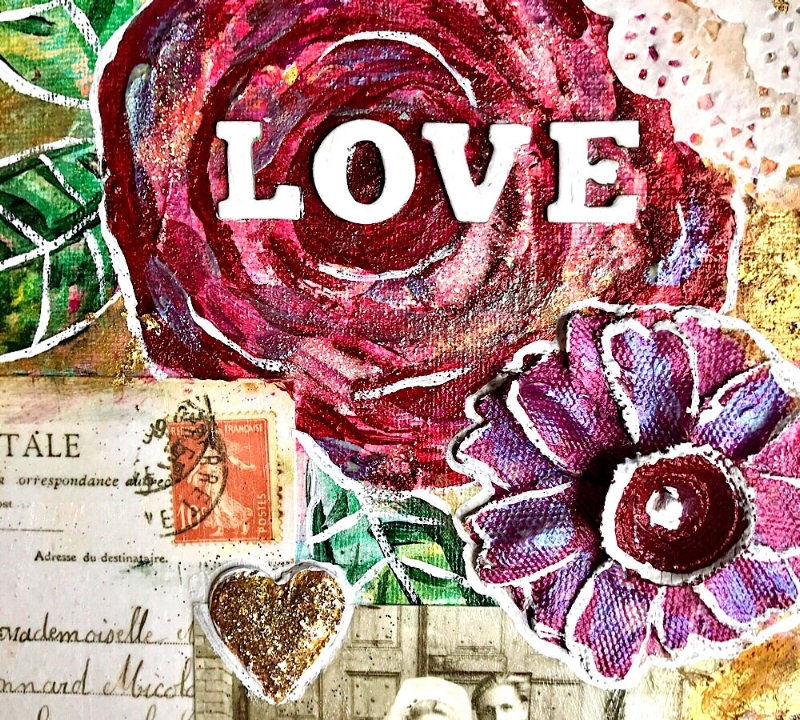 I was so inspired by this idea, I created my own “romance” art too, with some very old letters from when my husband and I first met 25 years ago. It is now hanging in my art studio and makes me smile every time I see it! :) Have fun making your own “vintage romance” artwork! All You need is LOVE for your inspiration! 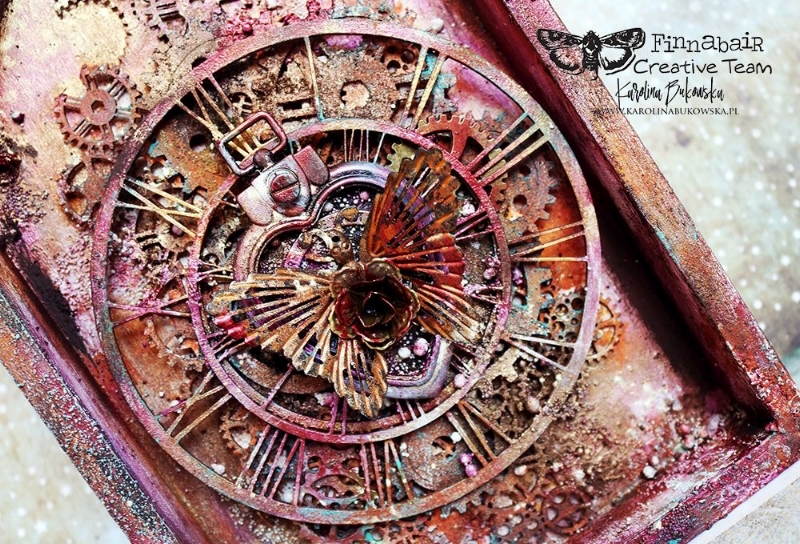 I love making projects made of multiple layers and textures.I created a wooden house with golden and rusty accents enriched with the gorgoeus red and pink Art Alchemy colors. The depth and the layers were created with the delicious Art Extravagance Graphite Texture Paste combined with Jade Impasto Paint. I simply can't live without textures and the possibility to discover new ways how to create them is something that makes me really inspired. I couldn't wait to play with the new Plaster Paste and I totally love the results. You should really try this one! It allowed me to create a rugged, rough texture, resembling the effect of chipping paint. Isn't it wonderful?! To complete my project, I added Mechanicals embellishments, also treated with Art Alchemy Metallique Romance Pink and Red Wine and some Art Ingredients Gold Mica Powder for a touch of sparkle. Don't forget about the Art Stones glued with Soft Matte Gel for even more amazing texture! Art Stones are so simple in shape and they are such an eye-catching element of any piece of art. Follow any of our groups below and watch for new challenges and fresh inspiration to be posted daily. Our goal is to INSPIRE you to be the happiest crafty person around!